In this guide you will see how Pioneer drives can book type +R and +RW single layer media. With official firmware only +R DL media will be book typed to 'DVD-ROM'. In the ImgBurn log you will see that the 'Book Type' is set to the same as the 'Source Media Type'. So what you need to do is to flash the drive with a patched firmware, that sets the book type to DVD-ROM for you. In this guide I will use the Pioneer DVD-RW DVR-216D as an example. Note 1: The flash instructions are only valid for a Windows NT, Windows 2000, Windows XP, Windows Vista or Windows 7 system. 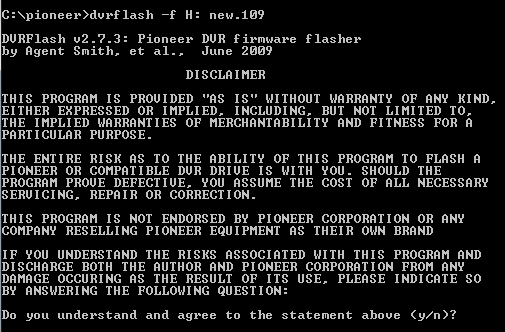 Note 2: The flash instructions are only valid for an original Pioneer drive. Note 3: The Pioneer DVR-118L, DVR-A18L, DVR-A18LBK, DVR-A218L, A218LBK and DVR-218L series of drives will automatically set the book type to DVD-ROM on DVD +R/RW single layer media when using original firmware. 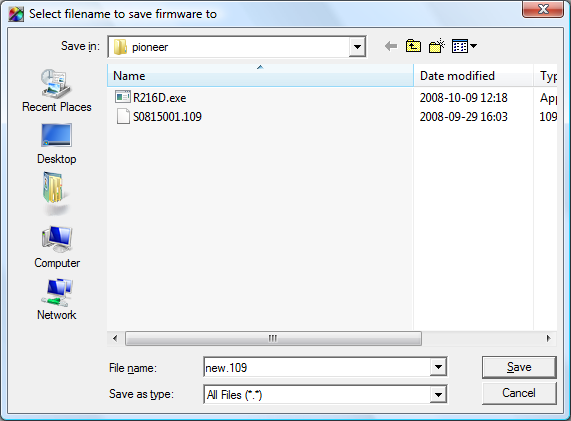 Download the appropriate firmware for your model of drive from Firmware HQ and save it to the hard disk. 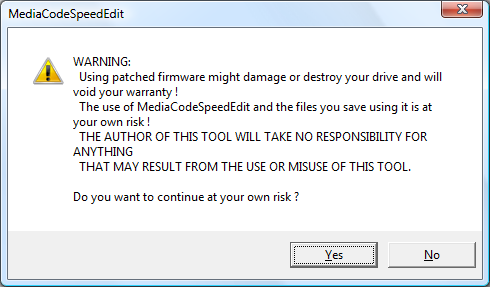 The original firmware file we downloaded is an executable file that contains both a flashing tool and a binary file. This binary file we need to have so we can change some data inside it. So we need to to unzip/extract the downloaded file to the hard disk, so we can get our hands on that file. This can be done with the free program 7-Zip or any other similar tool. In the following part we will use 7-Zip for this purpose. Assuming we now have 7-Zip installed, we can now start to extract the binary file. 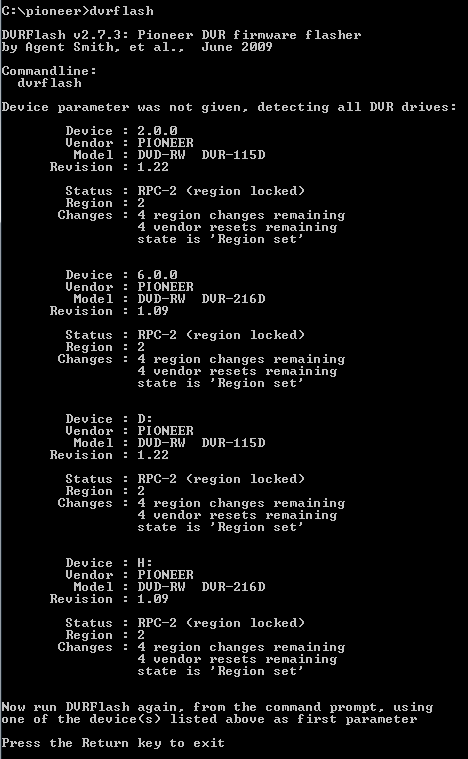 In our example the name of the file is 'DVR-216D_FW109EU2.EXE'. Right click on the 'DVR-216D_FW109EU2.EXE' file and select the menu option 'Extract files...'. Change the suggested location to where to save the extracted file to. We will use 'C:\pioneer'. Then click on the 'OK' button and let 7-Zip extract the file. We should now have a new folder named 'pioneer' with some files inside it. The file we are going to use as source in the following steps is the binary file named 'S0815001.109'. 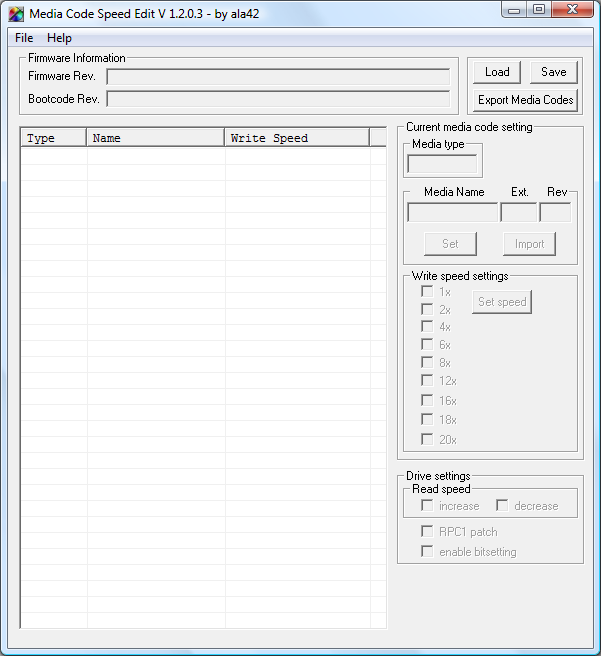 Download the Media Code Speed Edit tool for DVD-Writers and save it to the hard disk. We then need to unzip/extract the downloaded file to the hard disk. This can be done with the free program 7-Zip or any other similar tool. Run the file 'MediaCodeSpeedEdit.exe' from the location where we extracted the downloaded 'The Media Code Speed Edit tool for DVD-Writers' file. Press the button 'Load' and browse to the location where we saved the extracted downloaded firmware. 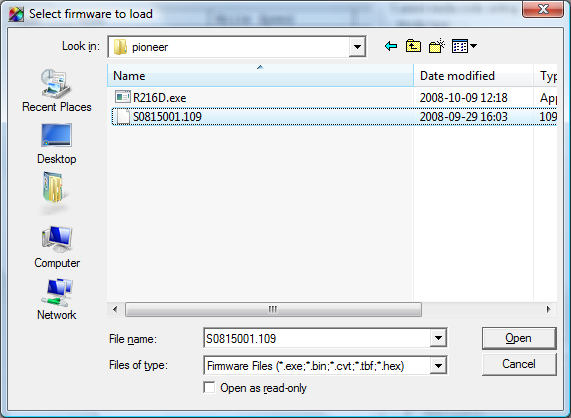 In our example the file is located in the folder named 'pioneer' and the file name is ''S0815001.109'. When the binary file is loaded we should see this. Check mark the option 'enable bitsetting'. Press the 'Save' button and we will see a warning window. We just ignore it by pressing the 'Yes' button. In our example we are going to name the new file and save it as 'new.109'. Press the 'Save' button and save it to the hard disk. We can now exit 'Media Code Speed Edit'. Go to the DVRFlash web page and download the current version to the hard disk. We then need to unzip/extract the downloaded file on the hard disk. This can be done with the free program 7-Zip or any other similar tool. To make it easier during the flash of the new firmware we are going to copy the flashing program to the same folder as we saved the patched firmware in. We should have some files in the extracted folder of DVRFlash. In our example the folder 'dvrflash_win32' looks like this. 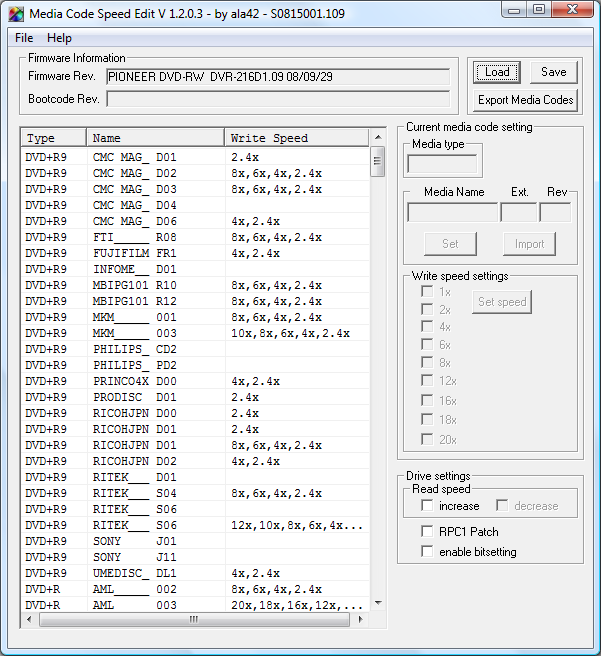 Just copy the 'DVRFlash.exe' file to the 'pioneer' folder. This 'pioneer' folder should now include these files. Before we flash the drive, we have to make sure that there is no disc in the tray and that the tray is closed. Also we need to close down programs that can affect the flash. In this guide we can see how you open up a Windows command interpreter window (DOS window). When we managed to open up such a window, we should see a command line prompt. We first need to change the path to the folder where we saved the flasher and the patched firmware in. In our example we named the folder to 'pioneer'. and press the 'Enter' key. Now we need to find out the drive letter of the drive we are going to flash. Luckily 'DVRFlash will do this task easily for us. In our example we want to flash the Pioneer drive DVR-216D. As we can see in the list, this drive has the letter 'H' associated with it. On your own computer it will probably be another letter. We are now ready to flash the drive with our patched firmware. In our example we identified the drive we want to flash as associated with the letter 'H'. If you drive is associated with another drive letter, replace the 'H' with that letter. We will now see a 'Disclaimer' text on the screen. Nothing to be worried about. and press the 'Enter' key. This brings up a question that asks us if we wants to flash the drive or not. We answer yes to this question. and press the 'Enter' key to start the flash. When the flash is done we will see that the flash was successful. We can now exit the Windows command interpreter window (DOS window). 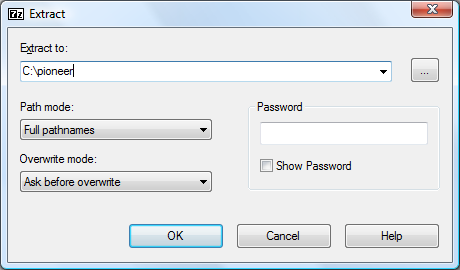 and press the 'Enter' key to terminate the Windows command interpreter window (DOS window). Now we need to restart the computer so the new firmware can be recognized by Windows. The next time when we burn a +R single layer disc we will see that the 'Book Type' is changed to 'DVD-ROM'.